These costumes were a few years ago! 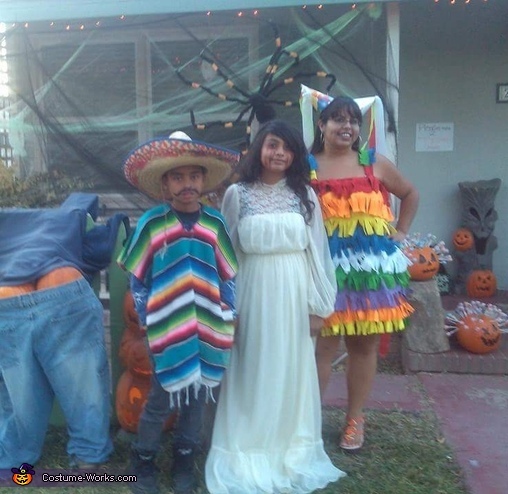 We didn't plan it but me & the kids all went as a Mexican theme. I was a pinata, my son was Pancho Villa and my daughter was the Llorona ( the crying woman. A legendary, Mexican ghost). I seen online a kid dressed in a pinata costume so I said I could pull that off! I got felt cut them up and was going to glue them on this dress I had but my Mom sewed it on for me instead. I got 2 party hats from the dollar store taped streamers on them and my costume was a hit (pun intended, lol lol). For my son, we had the pancho and I found the hat at the thrift store. It had a name of a resturant on it and I cut it off. As for my daughter, we found this beautiful vintage wedding dress at a thrift store. She, at the time didn't know what to be but wanted the dress. She came home and put red blood coming from her eyes & we said she's the Llorona!